Flying Podcast is up in Rufforth, near York, today talking to Phil Harwood of the Gyrocopter Experience. I first saw the interest in gyrocopters at the SPLASH Exhibition last year and was interested in seeing what all of the fuss was about. Phil firstly explained exactly what a gyrocopter is. He describes a gyrocopter as being like a small helicopter because it has rotors but that, unlike a helicopter, the rotors aren’t powered. 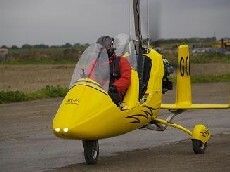 The gyrocopter has an engine for forward thrust making it like a cross between a helicopter and a flexwing microlight. The flying controls are similar to a plane but you do have to think like a helicopter pilot when it comes to landing and especially during emergencies. A key question I wanted to ask was about the safety of gyrocopters. 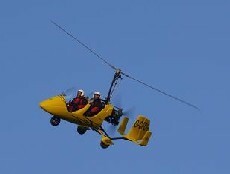 Phil believes that the modern gyro is the safest form of powered aviation. He explained that because the gyrocopter’s ‘wing’ is rotating it can’t stall and so you can’t spin. The gyrocopter can fly at zero airspeed and it can glide making ‘engine-out’ landings possible in a similar way to an auto-rotation with helicopters. The gyro’s landing distance can be as little as 5 feet meaning that you can cruise at relatively low altitudes without the worry of finding a large field for landing during an emergency. Further to the safety issue, Phil says that the history of gyrocopters had been a bit chequered. As most of the gyrocopters were home built and training was lacking; there were many accidents. Now however, modern, factory built gyrocopters are available that are certified by the CAA and as such are much safer. This radical change in the gyrocopter market has taken place over the last 3 years with the introduction of the MT-03 gyrocopter from Auto-Gyro. 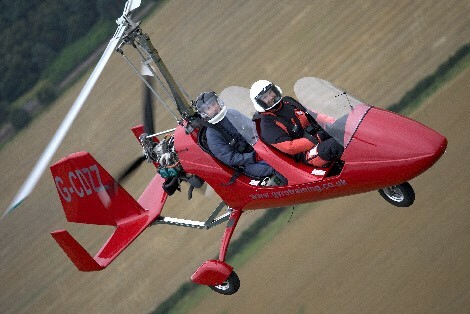 Phil claims that gyrocopter flying is now the fastest growing form of aviation. Gyrocopters make good touring machines, cruising at 80mph and with a duration of 4hrs. Plus they are less responsive to turbulence meaning that flights are much smoother than with conventional GA aircraft. Phil set up the Gyrocopter Experience with like-minded gyrocopter instructors to spread the word about gyrocopter flying. At time of recording the Flying Podcast, there are 4 locations: York, Preston, Lincoln and Oxford but there are more in the pipeline. To gain a PPL(G) licence you will have to undergo a 40 hour training course. However if you already have a flying licence you will be awarded credits against the total hors required. PPL(A) and NPPL licence holders will get a 10 hour credit whilst helicopter licence holders get 20 hrs credit. This entry was posted in All Podcast Episodes, Flight Training, Gyrocopters and tagged Aviation, Flight Training, General Aviation, Gyrocopter, Gyroplane, Podcast, podcasts, Rufforth by admin. Bookmark the permalink. I’m so going to have a try at this. Great to listen to the podcast btw.